The purple dusk of twilight time will steal across the meadows of your heart every time baby cuddles up with Stardust. 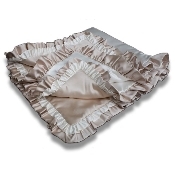 Trimmed in double ruffles, enveloped in elegant satin, Stardust wraps baby in heavenly comfort (required to ponder little stars climbing high up in the sky)! Satin /poly/hypo allergenic fill. 36-in. x 36-in. Washable.